Today I’m extremely excited to be interviewing Emma Myrick of Teaspoon of Nose blog and Etsy shop. Teaspoon of Nose blog is a lifestyle blog featuring posts on travel, recipes, and life. Emma also sells beautiful gold foil frameable quotes, stationery, and party goods at her Teaspoon of Nose Etsy shop. One lucky reader will win a free package of her stationery by entering the giveaway at the bottom of this post. I’m so delighted to introduce you to my readers today! Can you tell us a little about your background and how you started blogging? Thanks for having me! I started my blog as a creative outlet combining a lot of my favorite things. It started as a place to talk about the things I was passionate about, like cooking and travel. I’m always planning my next trip. I realized that a lot of my friends and family were asking me for advice about trip planning and locations. If I had a dollar for every time someone asks me about Hawaii, I’d be able to go back! I was born there and my husband and I went there for our honeymoon. I’m a communicator at heart, I really enjoy sharing and listening. The blog has become a way for me to do those things especially now that I live far from where I grew up. How did you choose the name for your blog and Etsy shop? You know how when you have kids or when you are a kid, and you like to play in the kitchen with random stuff? My parents would always hang measuring spoons off my nose. The one that stuck was the teaspoon, so my parents joked that I had a teaspoon of nose and the name stuck. I’d been blogging for a few years under the ‘Teaspoon of Nose,’ banner, so when I opened my Etsy shop it seemed easiest to keep it under the same banner! Your Etsy shop has a lot of great designs. How did you get started crafting with gold foil? I’ve always really loved the gold foil look: it’s simple and classic, can be made to be funky or elegant. It shows a lot of personality while still being timeless. I have a friend who introduced me to it. She has her own Etsy shop at Cate Paper Co., and she’s fabulous! I took the plunge to start my own business when I moved to rural Oklahoma. It’s something I’d wanted to do for years but with a spouse in grad school, money and time were too tight for this kind of side project. But once we moved (my husband’s in the Air Force), I realized it was the perfect time to take the leap! Plus, moving halfway across the country has reawakened a love of letter writing - is there anything better than getting something fun in the mail? It’s been fun to challenge myself to write letters even in this digital age of Instagram and Facebook. How do you decide what designs to produce? Good question! Some of it is printing things that I’d like to use myself. Most of my travel themes started as designs I’d use. Others are inspired by my friend’s hobbies, or icons I think would represent some part of their personalities. Some of my designs were designed for special requests. For example, I did an old-fashioned sewing machine design for another Etsy shop that does textile and fabric creations. For creating the designs, some I find online and others I draw myself. What makes your shop special and why should people choose your designs? I think the thing that makes my shop unique is that my items are 100% customizable. A lot of people will let you customize some things, but I’ll let you customize every single thing. Right now, I’m working on a special design for someone’s birthday. She wanted a custom birthday text instead of a name and a custom design, so we drew a few options and she got to describe exactly what she wanted. You don’t have to compromise and find something that is sort of what you would like, we can talk and create exactly what you want! You mentioned to me that you also do special orders. What has been your favorite project so far? One special project that I have done was making a friend’s wedding invitations. It was very fun to stretch those creative muscles. She entrusted me with creating something really important to her wedding, and I was honored to get to do it! Something I’m working on right now, that isn’t in the shop yet, is a “bridal shower in a box.” The kit will include invitations, decorations, garlands, food tent cards, a couple games, favors, and maybe thank you notes for the bride. It’s been really fun to think up everything you would need for a wedding shower! Several pieces of the kit are already available in the shop, and hopefully the whole set will be unveiled next month! 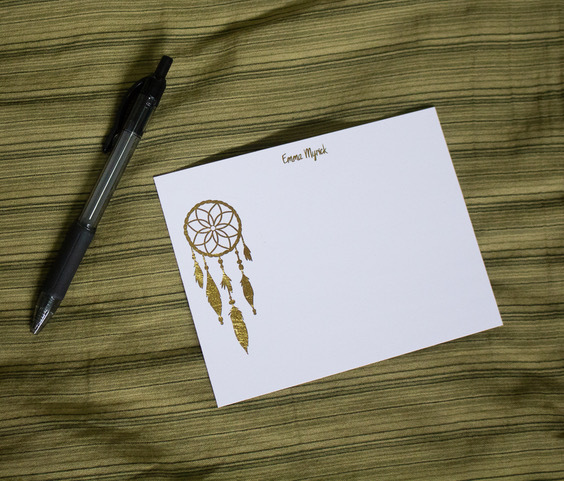 If someone has a project they would like to get custom gold foil stationery for – a wedding, bridal/baby shower, party, or another special event, what should they do? Reach out! There’s a button right on the front of my Etsy page. I love doing custom stuff and dreaming up what we can make for you. Plus, if what I make for the project is resalable – if I can make it and sell it in my shop again - I will definitely give you a discount! Where do you see your blog and Etsy shop in five years? I’m a military spouse, so we will be likely moving every few years for the foreseeable future. I want to grow my Etsy shop and blog into a something that I can take with me and not have to job-hunt at each new location! I’d like to offer your readers can get 10% off anything in the shop with the code confidentlyelegant. Thank you for having me! This has been so much fun! I love Emma’s designs and I hope that you will enter the giveaway to win a free package of stationery ($15 value)! And even if you don’t win please check out her blog and her shop! Thank you to everyone who entered and congrats to our winner - Tami! The giveaway will close in 7 days on Thursday, June 22 at 11:59PM EDT so enter now! The winner will be announced on this post and on the Confidently Elegant Twitter and Facebook page on Friday, June 23. Copyright ©2017 Confidently Elegant. Confidently Elegant and other logos or trademarks listed herein are trademarks of Company, Inc. in the U.S. and other countries. All rights reserved. What are you favorite designs at the Teaspoon of Nose Etsy shop?! Let us know in the comments!